The occurrence of peripheral nerve injuries (PNIs) related to sports and recreational activity is uncommon but can cause serious morbidity. 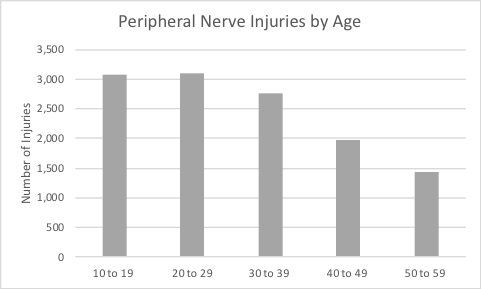 The purpose of this study was to utilize the National Electronic Injury Surveillance System (NEISS) database to determine the nationwide incidence, risk factors, and mechanisms of peripheral nerve injuries presenting to Emergency Departments (EDs) across the United States following sport or recreational activity. Between 2008 and 2017, the NEISS Database was queried for patients with a diagnosis code of nerve damage (61). Patients were then isolated to those with exercise, recreational, and sports related injuries as distinguished by product codes (3277, 3299, 5030, 1200-1299). Narratives of each nerve damage diagnoses were then evaluated to determine type of nerve injury. Incidence of injuries were calculated for age, gender, race, and activity using associated population data from the US Census Bureau. A total of 66,121 cases were identified over the 10-year study period. Of these cases, 14,336 (21.7%) were related to exercise, sports, and recreational activities with an incidence rate of 4.51 (95% CI, 3.41-5.62) per million person-years. Exercise related activities including weight lifting and associated exercise equipment had the highest incidence rate of PNIs of 1.66 (n=5286, 95%CI: 1.14, 2.19) million person-years, which was followed by cycling (IR: 0.41 per million person-years, 95% CI, 0.20-0.63). Significantly more males developed sports related PNIs than females with an incidence rate ratio of 1.91 (p = 0.0079). In addition, the number of PNIs was greatest during the second and third decades of life (Figure 1). Following a nationwide analysis of PNIs presenting to US EDs, exercise related activities were found to have had the highest incidence of PNIs followed by cycling. Males in their second and third decades of life were most at risk for sport-related PNI. Increased awareness and education regarding safe practices in exercise and cycling is paramount to prevent such detrimental peripheral nerve injuries from occurring, especially in young active males.